Using the solution to Activity 1.5, found in the previous section, develop a command file to create the student table and insert records into that table. Use SQL to display the entered rows. Part 1: How many students are there in the college? Part 2: How many units in total have been passed? 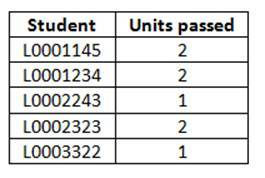 Part 3: How many units has each student passed? When creating the above reports, specify your own column headings rather than using the defaults. SELECT COUNT(*) "Total Units Passed"
SELECT student_number "Student", COUNT(unit_number) "Units Passed"